If you are planning to have your product photos printed in a magazine, catalog or brochure, your printing company or graphic designer may request that your photos come with “clipping paths”. In the simplest terms, drawing a clipping path on your product images is like creating an invisible “cookie cutter” right around the edges of the product being photographed. It defines the border between the edges of your products and the white background behind them. Clipping paths are very useful for graphic designers because most publishing software trims away everything outside the clipping path. That makes it easy for them to drop the photos of your products against another image or background without having to deal with the white background that fills the product photo. It also allows text to wrap right against the actual product instead of against the border of your rectangular photo. 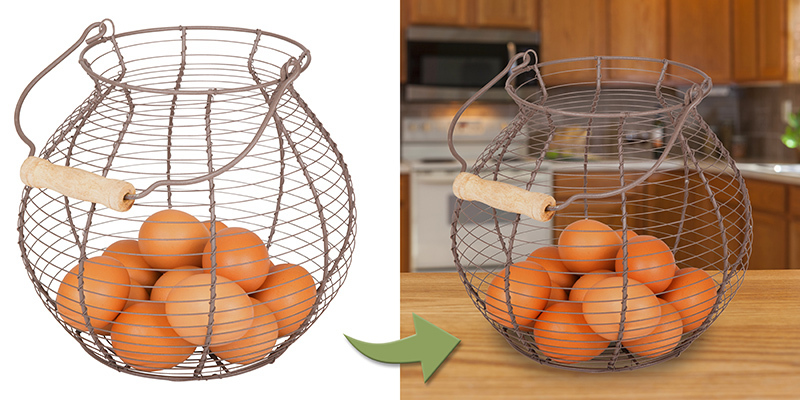 We photographed this egg basket against white background paper and hand-traced every little wire with the pen tool in Photoshop to create clipping paths. We then had a graphic designer drop it against a photo of a kitchen counter that we purchased from iStockPhoto.com and add a bit of shadow. Please note that we only provide the clipping paths — we do not merge photos. Also please keep in mind that a clipping path is not the same as a transparent background. For more information about clipping paths, click here.